The Ohio Valley Karting Association (OVKA) is a volunteer run organization founded in 1964. Our mission is to grow the sport of karting, by hosting races in a family friendly environment, and through our various promotional and charitable programs. Our membership comes mostly from the Cincinnati and Dayton, Ohio. OVKA does attract racers from as far away as Michigan, Illinois, Kentucky, and Indiana to compete against some of the best racers in the country. OVKA currently promotes 14 points races including the mid-season Memorial Champ Race that count toward our season Championship. In addition to the non-points Karting 101 and the yearend Charity Race. OVKA offers numerous classes, based on age, weight, and engine package. For the 2018 season all of our races are held at G&J Kartway in Camden Ohio. G&J Kartway opened 2 years before OVKA was founded. As a WKA master track, G&J has hosted numerous National and Regional events over the years. If you have questions about getting involved in the sport of karting, come to an OVKA event or call an OVKA board member located close to your home. We would be happy to help you with any questions on karting. Please click on the Contacts link for a full list of officers and board members. 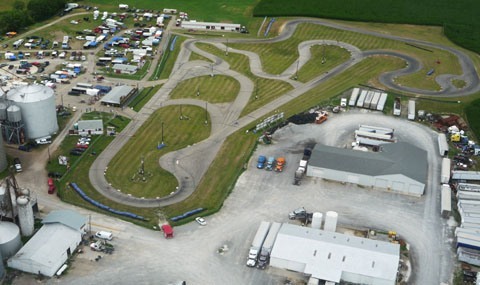 Located among the cornfields and pastures of Southwestern Ohio lies a WKA Master Track known as G & J Kartway. The track entrance is marked by the silos used by Barnets Inc. which is owned and operated by track owner Gary Gregg. G & J Kartway is the Home of OVKA. Click Here to visit the Official Track Website. Note - The G & J Kartway schedule may differ than the OVKA Schedule as G&J Kartway host events for other associations from time to time.